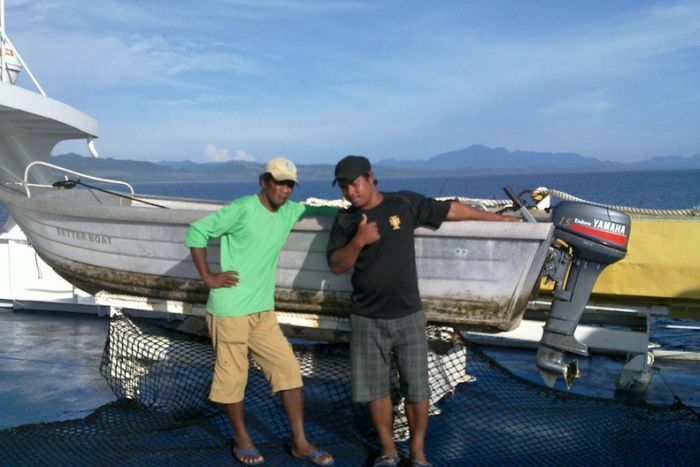 Two fishermen have survived almost four weeks adrift in the Pacific Ocean. The men from Kiribati were on a fishing trip when strong winds pushed their 14 foot boat towards the Solomon islands. The men, aged 20 and 40, were rescued by a US ship passing though the area. Captain Alfred Canepa from the Pacific Princess has told Radio Australia's Pacific Beat he was lucky to find them. "We were searching for fish...and 16 miles away on my bird radar I spotted a small spot of birds," he said. "I went to go check on my boat and luckily I turned that way to check them and we found this small boat with two men adrift at sea, lost." Captain Canepa says the men were fishing off Bahaba Island in Kiribati's Gilbert islands, when their engine gave out. The men drifted for almost four weeks, surviving on raw fish and rain water, before they were found, more than 675 kilometres away. Captain Canepa says he picked up the malnourished men in the nick of time. "Surprisingly, they are in a lot better shape than I would have been in, put it that way - it's a hell of an ordeal, believe me," he said. "Once they were taken on board I gave them water straight away...it was a dry spell they weren't getting much rain and what happened was they started drinking salt water and that's lethal. "They wouldn't have lasted another three days doing that." The men were taken to Solomon Islands, where they were held by Immigration officers, and arrangements made for their return to Kiribati. Captain Canepa says the men have spoken to their families, and he's promised the men he'll look after their boat. "My crew...we're going to fix it up, and when I'm by their island - I don't know when that will be - I'm going to return it to them," he said. "I gave them my word, which I will do - I will return that boat to them in working condition."